Audacity 2.0 is our current version. It has dozens of new features, developed in the 1.3 series. It replaces all previous versions, especially 1.2.6 and 1.3.14. See New Features in 1.3 for changes during the 1.3 series. See also Release Notes for more details. Uses libsoxr resampling library by default, instead of libresample, for higher quality and speed. New effects: "Studio Fade Out", "Adjustable Fade" and "Bass and Treble"
New option to reset Preferences on next launch. Clips did not drag to another track if mouse was over a selection. Mixer Board: Rendering four tracks resulted in a redundant Track Strip followed by a crash. Exporting to WAV or AIFF led to a "Libsndfile says" error or corrupted output due to order of metadata in imported files. Sliding Time Scale: fixed an audible discontinuity at the beginning of the processed selection; fixed a serious quality problem on Linux 64-bit. Bugfix to prevent zooming with mouse wheel or ball scrolling the content off-screen. Audacity 2.0.5 replaces all previous versions. It fixes crashes or hangs that were reported in Audacity 2.0.4 on some machines, and contains many other bug fixes and stability improvements. (OS X) Crashes when importing audio files are fixed. (OS X) Files can now be opened using Finder "Open with", and by double-click or dragging to the Audacity icon. (OS X) Audio Unit plug-ins are not loaded until used. This makes Audacity start faster and avoids startup crashes due to incompatible plug-ins. (Windows) On a very few machines, the Windows WDM-KS low latency host caused Audacity 2.0.4 to hang or the computer to crash. WDM-KS has been removed from Audacity 2.0.5 while we work on safely enabling this host. WDM-KS will still be available for testing in the Windows alpha development builds. 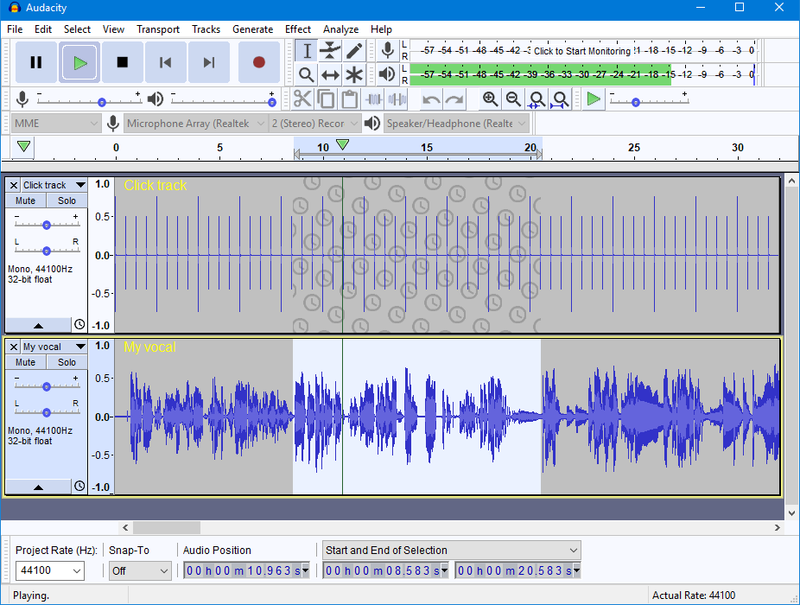 (Windows) Fixed a bug where Audacity would not record until the current input was reselected. (Linux) You can now navigate through an effect or other dialog using keyboard TAB. is this version compatible with windows 7 64 bit? - Audacity 2.1.3 now properly supports Windows 10 (thanks to an upgrade of the PortAudio library) and on MacOS has some previously missing support for Magic Mouse/Trackpad (thanks to Paul Licameli). - New Distortion effect, Rhythm Track (was called Click Track) and Sample Data Import (thanks to Steve Daulton). Also effects are no longer grayed-out when in pause. - On Mac, audacity.app is now added to /Applications/ directly rather than adding a folder there. - 64 bugs/annoyances in 2.1.2 fixed of which 15 were long-standing issues. Also lots done (Paul again) to systematically deal with memory leaks. - Improved recovery from full file system errors; in case of recording, Audacity 2.2.0 will preserve as much of the recorded data as possible. - Complete support for macOS 10.12 (Sierra). - Thorough update of the manual with new images, more hover texts, and more cross-references. - Easier zooming in and out with mousewheel, new Zoom Toggle command, and context menu for vertical rulers (thanks to James Crook). - Easy access to change keyboard bindings of menu commands by holding Shift key. - Detection of dropout errors while recording with overburdened CPU. - Improved contrasts in Light and Dark themes. - Several bugs/annoyances in 2.2.1 are now fixed. - Microfades are now an opt-in feature. They were always on in 2.3.0. - The advanced vertical zooming option is now available in the View->Zoom menu. - Regular interval labels now support range labels. See: 2.3.1 New Features for longer descriptions and links on how to use the new features. - A crashing bug on Linux that made Audacity 2.3.0. unsuitable for Linux. - Crash on Mac when right clicking on label. - Problems with Change Pitch, including not remembering parameter values.